Student accommodation has changed somewhat in recent years, with en-suites, modular furniture and, dare we say it, comfort coming as standard. As a result of improved quality, students are likely to be more selective when it comes to their accommodation of choice, with many turning to external providers. So, it’s up to student-housing providers to sell themselves in the best possible way – and for each of them, that starts with their shop window: the website. How did we arrive at our results? We used software to look under the bonnet of each site’s search-engine credentials, social following and content marketing output. We also looked at page-speed and crawled each site for technical issues. 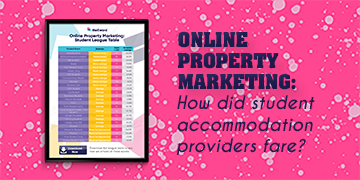 Want to learn exactly how all the student-accommodation providers we examined scored across all different aspects of their online endeavours? Download the FULL student league spreadsheet! Information for points 1,2,3,7 & 8 was gleaned from Moz, Google's Pagespeed Insights tool was used for point 6, Buzzsumo for point 4 and manual research for social following. Based on each company's performance in the above ranking factors, an 'eWord score' was given for each vertical. These scored were then tallied up to make up the final ranking. *Please note, whilst Moz was used to rank SEO-related factors such as Linking Root Domains, scores may vary when judged by other SEO measuring platforms. 1) Providers with good domain authority, on the whole, were richly rewarded with impressive search visibility figures. 2) Some providers, as demonstrated by low domain authority and small backlink profiles, need to view their sites as live marketing tools in need of constant care, rather than finished articles. 3) In spite of students living and breathing on YouTube, an alarming number of providers are ignoring this channel in their marketing strategies. 4) Many providers seem unaware of the perils of slow mobile page-speeds, which is worrying when you consider that millennials get most of their info (on any topic) via mobile devices. As part of our scoring strategy, we looked at the prominence of inbound links on the providers’ sites. Securing inbound links from reputable, authoritative sites is essential for increasing web traffic and boosting SEO, and, if featured on the right site, they can also be excellent publicity tools. Of course, building up the number of inbound links to a site is no quick or easy job, but there are ways that you can speed things up. For example, building relationships with key influencers in a given market, and including them on your site to begin with, will lay the foundations for them to link back to you. So, within the student property market, you may consider rounding up student newspaper editors or student presidents who have influential blogs, and ask them to contribute to pieces of content on your site. This would hopefully lead to them linking back to your article and would thereby allow you to tap into their audiences. Whatever the sector, we’re firm believers that less really can be more when it comes to social media. For some businesses, it makes perfect sense to have a presence on Twitter, Facebook, Instagram and YouTube, but for others, the focus may need to be on just one or two platforms. As a student-property provider, it’s essential to know where your target customers are consuming media – for example, are they prolific tweeters or do they tend to primarily be ’grammers? Sharing news articles that are relevant to students is a good way to become a resource centre for would-be occupants, so consider what events are going on in a particular city, updates on UCAS or student finance issues. It’s also essential to use video to the very best of your advantage – think about creating timelapse videos of new developments coming to life, or maybe show a student using the blank canvas your accommodation offers to create their own individual look…within reason, of course! 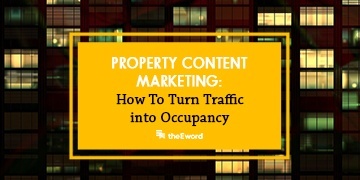 As well as driving traffic to your site and improving that all-important SEO performance, posting relevant blog content on your site will help to position you as industry thought-leaders and will enable you to develop relationships with potential occupants. As part of our study of providers, Unite Students scored the highest thanks to their blog shares over the last 12 months. The company’s blog section, The Common Room, is a one-stop shop for student success, with categories such as health and wellbeing, money and careers. Content includes everything from tips on how to stay fit to advice on how to manage bills, giving readers exactly what they need. Of course, creating a content plan is something that requires time and attention, so consider the keywords surrounding student life and what your prospects might want to know. Next, think about how this would translate into a blog post and what format it may take; for instance, how-to guides, first-person pieces or infographics are all valuable ways to get your content – and message – out there. Want to know more about marketing your student property? Get in touch. We've also made a guide to help you get started with your property marketing - from building customer personas to amplification through social media. Download your guide today!